Introducing the highest potency probiotic in capsule form. The Xtreme Care formula has been specially developed to improve the quality of life of patients suffering from gastrointestinal diseases and disorders. Disruption of the gut microbiome, termed dysbiosis, has been linked to numerous diseases including inflammatory bowel disease (IBD) such as Crohn’s disease and Ulcerative colitis, irritable bowel syndrome (IBS), Coeliac disease, allergies, asthma, ADHD, autism, and wider systemic manifestations of disease such as obesity, type 2 diabetes, and atopy. With high levels of actives cultures from 14 medicinal strains, the Xtreme Care works to help restore the healthy composition and function of the gut microbiome. May help with chronic skin conditions. 14 Targeted Probiotic Strains. Including Lactobacillus, Bifidobacterium and Propionibacterium for an action along the entire extension of the GI tract and to counter the effects of modern life factors that cause microbiome diversity depletion. Probiotic strains of human origin: naturally present in the GI tract as part of the normal healthy intestinal microflora. Does not contain soil based organisms (SBOs). Free of Gluten, Soy and Other Common Allergens. Every lot is tested and verified free of allergens by an independent, third-party lab for complete peace of mind. Products of the Multi-Strain line are free of 9 priority food allergens identified by Health Canada: wheat (gluten), soy, tree nuts, peanuts, sesame, eggs, seafood, mustard & sulphites. Free of GMOs. Verified Non-GMO. Easy to Swallow. Smaller size vegetarian DRcaps™. These acid-resistant capsules (free of synthetic chemicals) are designed to ensure that the ingredients are only released once in the intestines, main action site of the probiotics. Free of Titanium Dioxide. A pigment often found in probiotic supplements to make them look whiter or to give them more brilliance. Titanium dioxide has recently been classified by the International Agency for Research on Cancer (IARC) as an IARC Group 2B carcinogen. Since no coloring agents are involved in the manufacturing process of our capsules, the probiotic capsules appear as their original color which is a light to dark beige. Kosher & Halal Certified. Meet the dietary requirements of Kosher and Halal laws. No Refrigeration Required. Can be stored at room temperature for up to 24 months. Made in Canada. From lab to shelf, NOVA Probiotics controls the overall manufacturing process of its products. 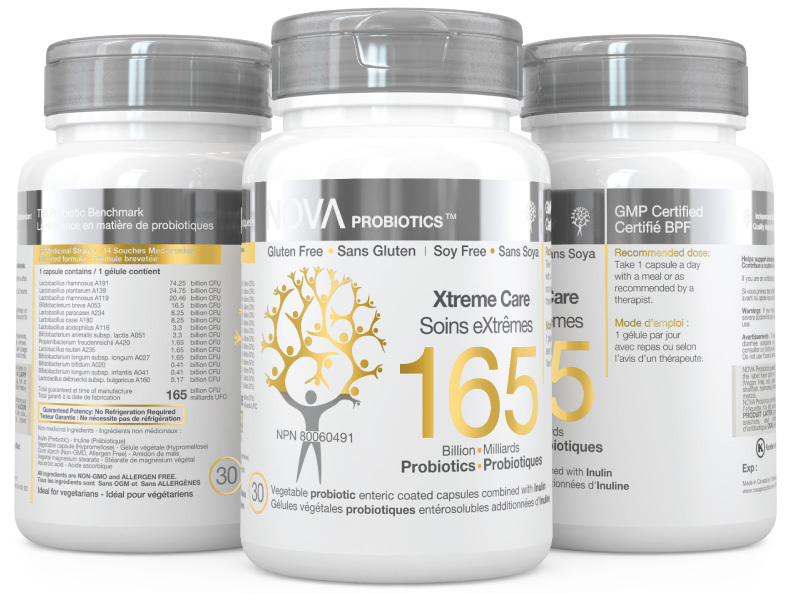 All probiotic strains and formulas are made in-house and exclusive to NOVA. Awards and Recognition. NOVA Probiotics’ formulations have won well-deserved praise from users and the industry. Not sure which product is right for you? Please ask the advice of your therapeutic practitioner or contact us.